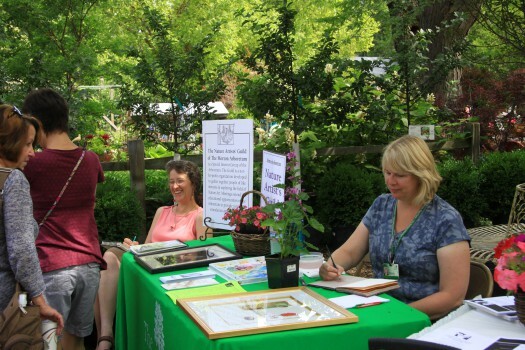 The Growing Place, 25w471 Plank Road, Naperville, IL, has again asked members of the Nature Artists’ Guild to return for their annual Gardener’s Art Festival, a fun celebration of plants and art, taking place on Saturday, June 20, 2015! Space is limited to ten artists, so members of the Nature Artists’ Guild who wish to participate in this event should contact Mary Ann Jimenez (whose e-mail address can be found in their Yearbook) as soon as possible. Our artists will be featured from 11 until 3 pm, and can stay the entire time or just 2 hours, and will be working right amongst the flowers, shrubs, trees, and garden art of The Growing Place or at the Nature Artist’s Guild information table. Most types of media are welcome, and styles can range from detailed botanical sketches to impressionistic views of the many garden tableaus featured at The Growing Place. Participating artists should bring a chair, some water, art supplies, and if desired, small examples of some of their finished artwork. This is a wonderful opportunity to participate in a lively and festive event, where visitors from throughout the area who are interested in both gardening and art can view our talented Nature Artists’ Guild members at work! For more information about The Growing Place, please visit their website by clicking here.